. 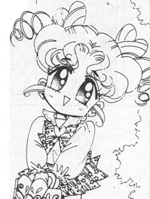 : Lunar Palace v.5 - Manga: Sailor Chibi Chibi :. Power: Sailor Chibi Chibi is Sailor Cosmos who is the "Ultimate Sailor Moon". Chibi Chibi doesn't really talk, she repeats words that are said to her. She doesn't form complete sentences until the end of Sailor Stars Volume 3. No one knows if Chibi Chibi is Rini's sister or Rini's daughter. Chibi Chibi poses as Bunny's sister. Chibi Chibi is NOT Sailor Chibi Chibi Moon.